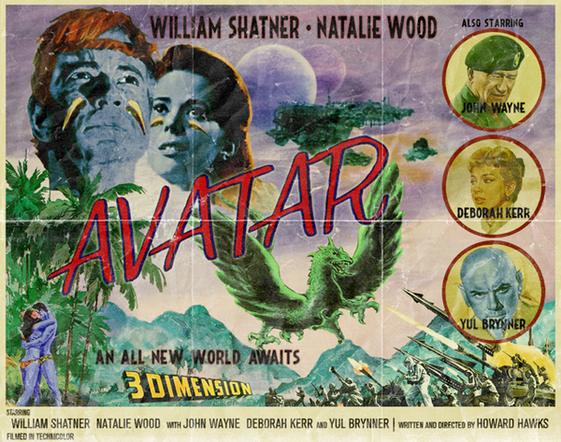 Imagine if, five decades before James Cameron set to work on it, it had been Howard Hawks instead who gave us Avatar... starring William Shatner, Natalie Wood, John Wayne, Deborah Kerr and Yul Brynner? It would probably look just like the poster on the right. And that's just one of the many very kewl "what-if?" scenarios that artist Peter Stults has come up with in "Movies from an Alternate Universe". Stults has brilliantly executed a series that... well, just try not to imagine Christopher Walken as the T-1000 when you see this rendering of Terminator 2: Judgment Day!